Do you know people are spending more money on travel and vacation on the Internet? The travel industry has undergone plenty of changes, especially in the past two decades. In the US, the number of travel agents dropped from about 124,000 in 2000 to about 73,000 in 2016. This is due to a change in the business model of most travel agencies triggered by the increase in online booking as well as the popularity of telecommuting, rendering many corporate trips unnecessary. However, in the last two years, independent travel agencies have seen an increase in business. This is mainly because travelers claim using an independent travel agency can save time by sparing them frustrations associated with planning their trips themselves. Another reason for the popularity of independent travel agencies is the benefit of customization in creating vacation packages and trip tours. Independent agencies have the requisite tools to impeccably piece together the exact trip, vacation package, and tour you want, which could be time-consuming and challenging on your own. Independent agents have an ever-increasing list of trusted suppliers and contacts, ranging from private drivers to high-end and luxury VIP experiences. Besides saving time, independent travel agencies can also help you save money. Travel Agencies linked to large and resourceful networks could land you incredible deals, like special pricing on airfare and hotels you can’t access on your own. Also, independent travel agencies make their recommendations based on the particular requests and needs of their clients instead of basing them on industry bonus gifts or sales incentives. What are the risks of being an Independent Travel Agency? Greater price transparency as that travelers are more informed when it comes to trip prices. Most of them are sensible enough to explore different options and find the most suitable deal. Decrease in customer loyalty because of the availability of more holiday bargains, especially on the internet. A handful of companies have a stranglehold on the travel industry, which can drive out new and smaller businesses out of the industry. The travel industry is an incredibly tricky business when it comes to building credibility and trust. Costly mistakes could occur if companies do not take full advantage of the latest technology to help eliminate human error. High dispute rate on credit card processing. Due to the nature of most travel expenses are paid prior to the travel. The travelers may change the plan and decided to cancel or dispute the transaction. This may cause credit card processor to flag the merchant account and even close the merchant account. How does independent travel agency make their profit? Independent travel agencies offer customers guidance and expertise when they book a trip of any type. In exchange for their services, most independent agencies get commissions from different suppliers who usually pay after the successful conclusion of the trip. Independent hotels and motel businesses have individual contracts or deals with travel agencies and companies. The deals could depend on a company’s policy or on the ability of a particular travel agency to provide customers. The going rate is usually in the range of ten to fifteen percent, which is deducted from the supplier’s profit. Rental cars, local tours, and transfers are a profitable component of an independent agent’s portfolio. As most transfer companies and tour operators are small businesses – they are often located in one region, and they are happy to conduct business with successful independent agencies that could deliver them a high number of tourists. One of the most lucrative items on an independent travel agent’s menu is travel insurance. It is relatively low-risk and low-cost but often comes at a high price tag for the travelers. Airline tickets, however, are often the least profitable element of the trip for most travel agents. Independent agents are offered a certain commission rate by the airline usually at the beginning of each year. 5 Steps to increase profit and lower the risks. A good relationship with travel package suppliers. Building a strong and healthy relationship with the supplier is the very important. It is the best way to lower the cost on travel agency and increase profit. A well planned marketing strategy. Digital marketing on the Internet and the life-line of travel agency nowadays. Without a highly visible online present will take you business to nowhere. Implementing a solid SEO (search engine optimization) strategy will rank your travel agency business higher in the game. Word of mouth is the most inexpensive way to bring you more new customers and return customers. Properly use online reputation management system and closely monitoring your Yelp, Google. Facebook reviews will help your brand go viral. Be creative! Don’t limited your service to just the suppliers that your agency work with. Create new travel package for different types of travelers. Luxury travel is on the rise. Treat your traveler like a VIP. A reliable credit card processing merchant account is extremely important for an independent travel agency’s profit as the option streamlines the operations by helping independent travel agencies accept credit card payments. It is likely that most customers prefer the option to use their credit cards as they are much easier to track and carry. It offers independent travel agents a competitive advantage over their competitors, especially those who do not accept credit cards. In addition, your travel agency can take customers orders round the clock, throughout the year if it has a credit card processing merchant account. Moneck Payment Solutions, merchant account solutions, are the best option for an independent travel agency because they have thorough and in-depth experience of the industry and offer convenient payment solutions that can help travel agents accept credit card payments. 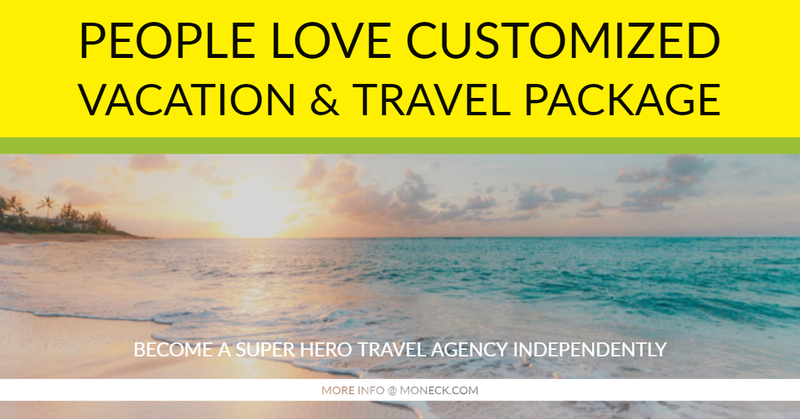 Moneck offers competitive terms and rates that can boost the profitability of independent travel agencies. All types of travel agent operations can benefit from Moneck’s solutions, i.e. over the phone, in person and online. Moneck’s chargeback prevention and dispute monitoring services are considered the best in the industry. Moneck also offers both offshore and domestic credit card processing solutions and can be reached at Moneck.com and 888-405-3093.